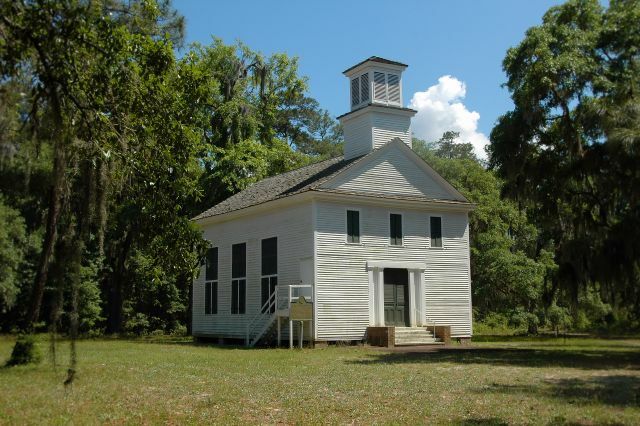 Midway Congregational Church, founded in 1754 and a seat of power in the Colonial period, was associated with three satellite congregations known as retreats, because their locations, slightly more inland than Midway, offered a respite from the malarial swamps of the coast. The last of the retreat churches to be established was located at Dorchester. Its origins can be traced to nearby Sunbury, a short-lived boom town founded in 1758 whose trustees were members of Midway Church. Sunbury thrived nearly from its inception, rivaling Savannah in commercial importance, but its proximity to Fort Morris lead to its capture and subsequent burning by British troops during the American Revolution. While many such casualties of the war recuperated, Sunbury never seemed to regain its prominence after the devastating four-year occupation that followed. The hurricane of 1824 and a yellow fever epidemic sent many of its residents scattering into the nearby countryside. Huge plantations with names like Laurel Grove, Arcadia, Melon Bluff, Cedar Point, and Palmyra were emerging in the countryside around old Sunbury. In 1843 upon the suggestion of Reverend Thomas Sumner Winn, a tutor for prominent Presbyterian minister Charles Colcock Jones, a site was chosen for a retreat between Sunbury and Midway. It was originally known simply as “the Village,” but was soon christened Dorchester, in tribute to the heritage of its citizens. Some families built summer homes at Dorchester, though many tore down their dwellings near Sunbury and rebuilt them on the higher and drier ground the retreat afforded. As this new location was only six miles from Midway, the idea of building a church was not initially entertained, though an academy was built in which Sunday school was regularly taught. By 1854, with the continuing decline in membership at Midway, the families of the village built a permanent church, which still stands today. The old town bell from Sunbury, dated 1799, was placed in the steeple. The land was donated by Bartholomew Busby, who owned the nearby Melon Bluff Plantation. At first it was used only in summer, but by the onset of the Civil War was in regular use. The church was officially recognized by the Savannah Presbytery in 1871 and named Dorchester Presbyterian Church. The church holds services on the first Sunday of each month at 5 PM.